Keep fruit flies and spiders out of your draft beer faucet with this handy plug brush. Plugs your faucet when you are not using it. Attached brush cleans faucet on the way in and out. We like to spray the brush moist with Alpet Spray Sanitizer for the most sanitary seal possible. To be able to plug the faucet when thereâ€™s no keg attached and to keep the fruit flies out. To keep bugs out of my taps between uses. 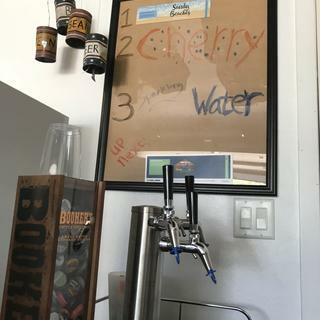 Added taps and needed more. My keezer is in the garage, this keeps bugs out of the tap and allows sanitizer to remain in the tap..
Looks like a good idea. For 4 bucks it's worth a try. After trying different options, these seem to be the best one. It allows the faucet to drain without holding liquid. I like it. These fit the Intertap faucet once you file them down just a little bit. Very cheap. Mine fell apart. Hello John - Krome typically produces a very sturdy product. Please give us a call at 1-800-600-0033 or email us at info@moreflavor.com so that we can assist you. We are here to help. Cheers! I like this product and will continue to use it but as received the plastic plug at the base of the brush does not fit into the end of an Intertap faucet. I found that I had to shave down the four plastic tabs to allow the plug to slide into the end of the Intertap faucet. Unless the plug can slide all the way into the faucet, it can still allow insects like fruit flies to enter your tap. It only took a few minutes with a razor blade knife to reduce the diameter of the plug.It may fit a Perlick faucet better but be aware that as is, it does not fit the Intertap faucet. Hello Stephen, thank you for your review. Seems these brushes are made for generic style faucets. If I could recommend, we also offer a CE94 and CE93, these faucet caps may better suit your needs and keep flies out. Just enter those product SKUs in our search bar. Bought 4 of these, along with 4 Perlick faucets and the plugs do not fit flush in the faucets. Bit of a disappointment. Didn't see this info in the product description when I made the purchase. Might need to be added. Presumably would be a good product for faucets that it fits. Love these brush/plug combos. They work well to keep the taps clean and seal tightly to keep the fruit flys away. A no brainer purchase if you keg beer. this little piece has helped out a lot. Keeps taps super clean when used right and makes life easier. highly recommend this for your taps. I've got a 4 tap kegerator, and these have been a life saver. I was having a big problem with fruit flies, and I had to get something to keep them away. I tried a few of the cheaper rubber caps, and wasn't a big fan. They were always a pain to get off, so I figured I'd try one of these caps. They make a great seal, and are much easier to use than the rubber caps. As a few other reviews pointed out, they do get dirty after a while, but I just occasionally rinse them in hot water and they look good as new again. I've had mine for quite a while now, and the bristles are still in great shape. I have perlick faucets and found that the forward sealing design on of the perlicks keeps them pretty clean on the nozzles. I use these when I plan on leaving them for an extended period of time. These are great to help reduce gunk build up in your taps. They need a little cleaning every so often, but no biggie. I've got one of these in each of my taps. They're easy to use and don't just cap the taps, they clean/sanitize the inside. I swish them in a jar of StarSan each time I remove them to pour. Two downsides: 1) even with that santizing, bristles become beer stained quickly and 2) if you accidentally open you tap while they're attached - beer sprays everywhere (like when you have your thumb on the end of a water hose). That's more my fault than theirs. These are great for helping keep my taps clean. Just remember to clean the caps every now and then as they can get dirty and moldy if they aren't used for a long time. Great for sealing up taps and also scrubbing clean. Pick one up for every tap you have! These work great on taps. keep the insects out of the taps. I lost one before I clued into the hole on the handle. I use a magnet tied to them and attach to your kegerator/fridge. Havent lost another one! The bristles are tight and keep the taps clean.